Tonight at La Milonga Azul, master tango instructor Christy Cote' is your tour guide into the romantic, dramatic world of tango. At this "milonga" (the Argentinean for tango dance party) you'll become fascinated by the mysterious music and the magic of the dance. Beyond the fun of learning new dance steps, Christy welcomes you to the intriguing culture of Buenos Aires. Bring a dance partner or meet one here. See you Friday! La Milonga Azul welcomes all tango dancers to enjoy a warm atmosphere, great music, and the finest dance floor in San Francisco. On a typical Friday night, we usually start the evening with a group class taught by professional tango dancers from the Bay Area or visiting instructors from Buenos Aires and around the world. 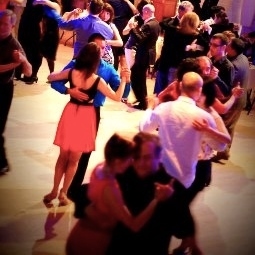 If you're new to Tango, the class is a prefect warm-up before the party. It's also a great way to meet people if you're new to the Bay Area. Dress to impress, please. While our events are typically not very formal, you'll feel most comfortable if you bring it up a notch or two above casual.